A trio of electro gems from Midnight Star – served up on 2CDs, with bonus tracks too! First up is the classic No Parking On The Dancefloor album – a popping party classic from the 1980s – filled with plenty of catchy electro numbers, all served up in a sublime blend of pop and soul! The Calloway brothers are at the height of their powers here – and the album strikes a perfect balance between mainstream soul and percolated electronics – never falling too far into one direction, and making a number of different strands resonate perfectly together – from mellow soul, to street sound jammers, to more conventional tracks that helped make the record a huge crossover success for years to come! 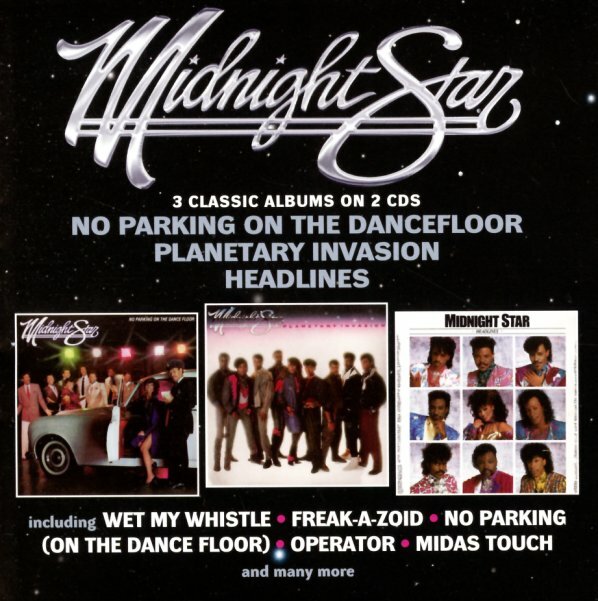 The set features 2 of Midnight Star's undisputed classics – "No Parking" and "Freak A Zoid", the latter of which is a great electro number that's as groovy as it is silly – and other tracks include "Slow Jam", "Playmates", "Electricity", and "Wet My Whistle". Planetary Invasion is a great little record that has Midnight Star taking all the outer space funk of the 70s P-Funk generation – and fusing it into a much leaner groove for the 80s! There's plenty of planetary sounds going on here – as the electro beats and keyboards certainly sound futuristic, and all the vocoder vocals come off with a nicely alien vibe – yet all while grooving together perfectly, in that way that made Midnight Star one of the few 80s groups who could take the beats from the streets and make them work so wonderfully in the mainstream! Titles include the classic "Operator", plus "Let's Celebrate", "Curious", "Scientific Love", "Planetary Invasion", and "Body Snatchers". Headlines has sweet beats and plenty of grooves – an 80s funk classic from Midnight Star, and one that seems to have the group picking up a bit of energy from the hip hop scene as well! The album's still got the electro soul vibe of previous records, but maybe is even beat-heavier overall – almost showcasing a style that would later emerge as new jack in the hands of some younger artists within the next few years – but still perfect for the kind of playful interplay that made the Midnight groove so great! Titles include "Midas Touch", "Stay Here By My Side", "Close To Midnight", "Searching For Love", "Close Encounter", "Dead End", "Get Dressed", "Engine No 9", and "Headlines". Bonus tracks include 7" single mixes of "Wet My Whistle", "Freak A Zoid", "Body Snatchers", and "Operator". © 1996-2019, Dusty Groove, Inc.